Many companies have thresholds set for their retirement packages. Some thresholds are based entirely on age. Some are computed based around the employee's age and the number of years of service with that company. The latter is called the Rule of 80. 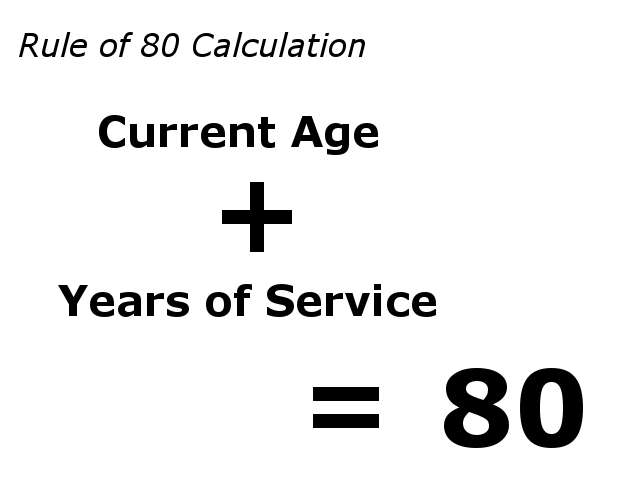 This is where the age of the employee and the number of years of service equals to 80. Example: Someone who is 50 years old and has worked 20 years with the company is hitting the Rule of 70, which is 50 + 20 = 70. Question? How many more years is this person away from the Rule of 80? A quick look, you may figure that s/he will need to work 10 more years....ie. 80 - 70 = 10. But the way the Rule of 80 works is that every year towards your target of 80 takes away 2 years from the rule. Mathematically, it is pretty easy. When is Your Rule of 80? We have developed a Rule of 80 calculator. Fill in the below information to figure out your Rule of 80. It will calculate to the day your Rule of 80. Rule of 75? Rule of 90? Rule of 100? No problem. Just change the Rule number to your desired rule, and we will do the math. Kudos to those committed to make it to the Rule of 100!